Bold, vibrant colors, elaborate ornamentation, and sophisticated geometric lines fill these new Art Deco designs! 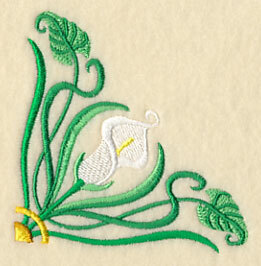 Add a unique look to your embroidery projects with glamorous designs straight out of the Jazz Age. Contemporary border and corner patterns boast gold details and intricate patterns, while fresh floral motifs utilize strong, graphic lines and classic Art Deco symmetry. 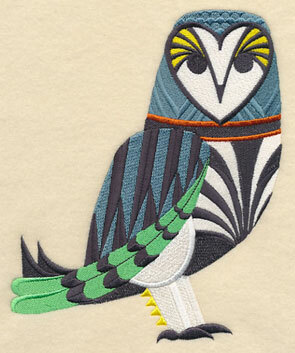 Don't forget the new bird designs -- each of the fabulous feathered friends explores the beauty of the 1920s. 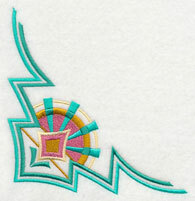 We love using these Art Deco designs on pillow shams, tote bags, and apparel. We've even thrown in a few vintage style designs that are perfect for tea towels and other lightweight fabrics! 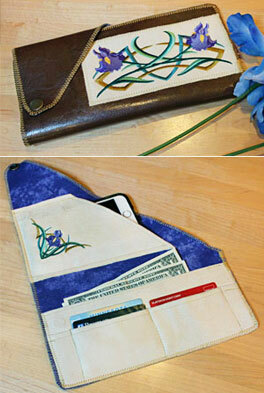 Give a DIY wallet an extra-stylish look thanks to Art Deco-inspired designs. Pay homage to the Jazz Age with a collection of Art Deco-inspired designs! The classic visual arts style is distinguished by its use of spirited, lively colors, exquisite ornamentation, and ornate geometric lines. It was first introduced during the 1920s, and is making a comeback in art and fashion today. 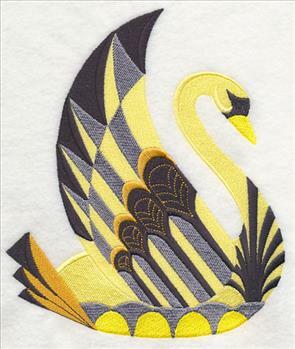 Bold, graphic lines and a distinguished color scheme give this swan his Jazz Age-style design. 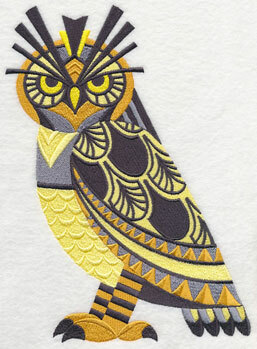 A stunning great horned owl is equally decked in the traditional style. 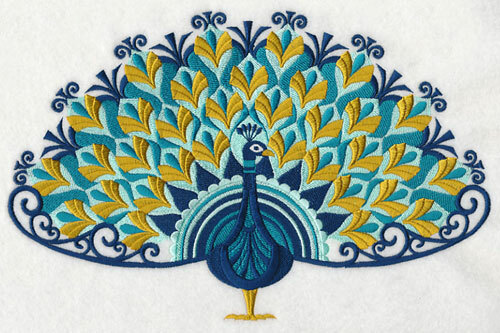 6.89" x 9.50" and 5.65" x 7.78" and 4.86" x 6.70"
Fabulous geometric details, thick satin stitches, and a gorgeous color combination mean this intricate peacock is sure to wow. Stitch the majestic creature on a variety of projects, including pillows, tote bags, and more. 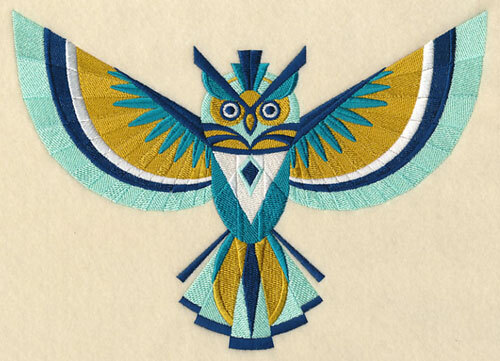 10.70" x 6.90" and 9.10" x 5.87" and 7.80" x 5.03" and 6.87" x 4.43"
A striking Art Deco long-eared owl spreads his wings in this gorgeous embroidery design. 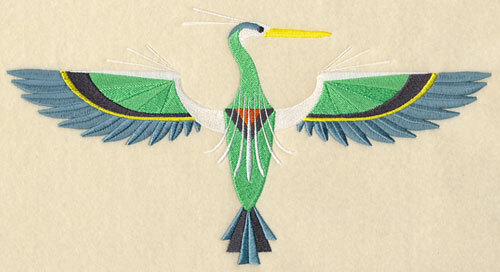 We love the way the 1920s elements give the bird a unique look -- add him to your next embroidery project! 9.49" x 6.89" and 7.80" x 5.66" and 6.75" x 4.90"
A great blue heron shows off its 1920s style with vibrant colors and bold lines. This dazzling Art Deco bird is a terrific addition to tote bags, pillows, wall hangings, and more. 11.73" x 6.27" and 9.38" x 5.01" and 7.78" x 4.16" and 6.85" x 3.67"
This jazzy barn owl is a fabulous example of traditional Art Deco style. 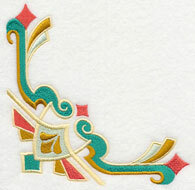 The color scheme, patterns, and lavish ornamentation featured in the embroidery design perfectly fit the traditional characteristics of the Jazz Age. 6.39" x 7.79" and 5.87" x 7.16" and 4.87" x 5.93"
Below, beautiful irises and calla lilies sit in Art Deco-inspired vases. These designs feature the classic characteristics of the Jazz Age style, including its use of symmetry, bright colors, and graphic patterns. 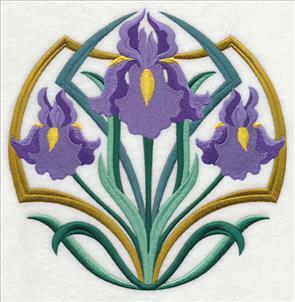 7.25" x 7.81" and 6.51" x 7.01"
5.91" x 5.86" and 4.88" x 4.84"
Tall, exquisite irises are a widely popular flower, and are wonderful additions to a variety of embroidery projects. Named after the Greek goddess who rode rainbows, the perennial is hardy, reliable, and easy to grow (not to mention stunning, too!). They are commonly planted in home gardens, thanks to their ability to attract butterflies and hummingbirds and to make lovely cut flowers. 7.79" x 7.76" and 6.90" x 6.87"
5.90" x 5.87" and 4.91" x 4.89"
7.77" x 7.77" and 6.90" x 6.90"
Irises have a distinctive look with three large outer petals called "falls" and three inner upright petals called "standards." They're a well-known summer flower, and look terrific when added to warm weather projects such as outdoor decor, pillows, or lightweight apparel. 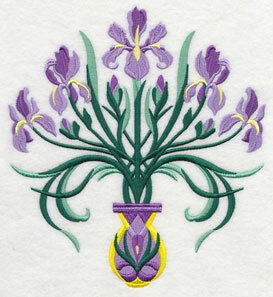 3.26" x 7.79" and 2.88" x 6.90"
2.47" x 5.90" and 2.05" x 4.89"
The iris is the French royal standard fleur-de-lis and is also the symbol of Florence, Italy. 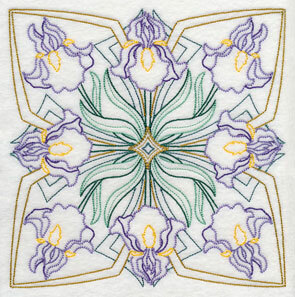 Stitch this Art Deco iris border on bath towels, quilts, table linens, and more! 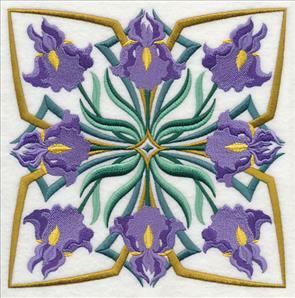 7.80" x 3.25" and 6.90" x 2.87" and 5.90" x 2.46" and 4.90" x 2.04" and 3.90" x 1.63"
Add a corner iris design to blankets and quilts, linen napkins, and pockets for a fabulous addition to your embroidery projects. 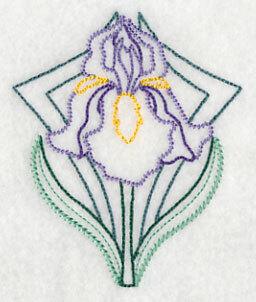 This design combines a classic iris with gold Art Deco detailing. 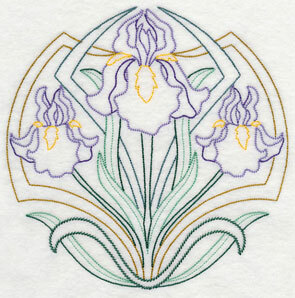 3.31" x 3.32" and 2.92" x 2.93" and 2.50" x 2.51" and 2.08" x 2.08" and 1.65" x 1.66"
Pick your favorite Art Deco iris design, or buy them all in a design pack to get an even larger discount! 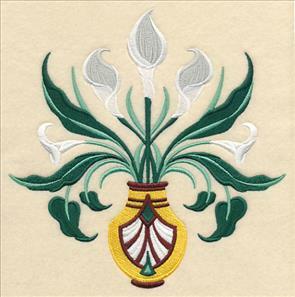 The intricate Art Deco iris designs are also available in the "vintage" style of embroidery. These light and airy stitches are perfect additions to smooth and neutral fabrics, such as quilter's cotton, linens, denim, and canvas. 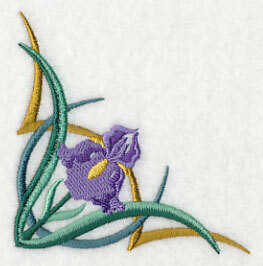 5.90" x 5.90" and 4.90" x 4.91"
Create quick-stitch varieties of the beautiful iris designs for your summertime projects, such as on low-nap towels, bed and table linens, and shirts and skirts. 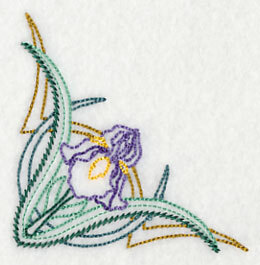 They're a delicate alternative to the satin-stitch Art Deco irises. 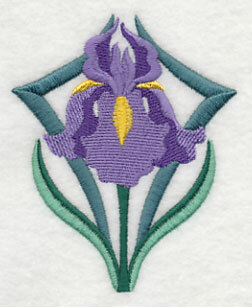 2.49" x 5.88" and 2.08" x 4.90"
Add elegance and beauty to your embroidery projects with a vintage-style iris border. 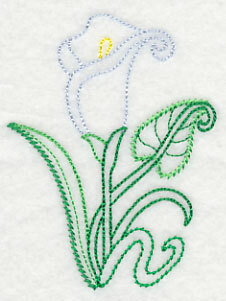 The fast-stitching design is great on tea towels, aprons, and tote bags. 7.80" x 3.27" and 6.90" x 2.89" and 5.90" x 2.47" and 4.90" x 2.06" and 3.90" x 1.63"
A light and open iris is a fabulous addition to shirt pockets, quilt corners, or the edges of tablecloths. The Art Deco embellishments and pretty floral design make an irresistible combination. 3.30" x 3.30" and 2.93" x 2.93" and 2.50" x 2.50" and 2.07" x 2.07" and 1.65" x 1.66"
These vintage-style iris designs can be ordered individually by clicking on the links shown above. Or, buy them in a design pack to get the whole collection! 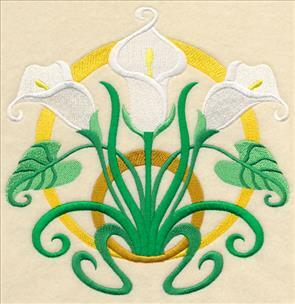 Calla lilies traditionally signify magnificence and beauty in the flower world, which is no wonder why the stunning flower is such a gorgeous addition to a wide variety of embroidery projects. Not only do they have one of the most unique floral shapes, but they also come in a wide variety of colors. We chose to portray them in their most common color scheme: white with a yellow center. Despite their large, trumpet-shaped blooms, calla lilies are actually neither callas nor lilies. The exquisite flower is classified as its own type of bloom and is widely known to symbolize purity, heavenly bliss, and faith. 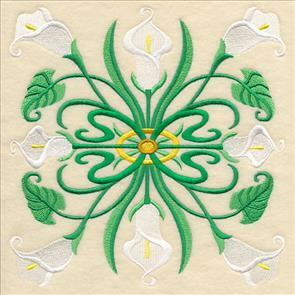 3.25" x 7.80" and 2.88" x 6.91"
2.47" x 5.91" and 2.05" x 4.90"
The bold colors, geometric shapes, and lavish ornamentation of the classic Art Deco style is ever present in this vibrant calla lily border. 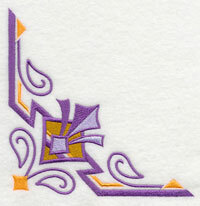 It's a terrific addition to towel sets, aprons, and placemats. 7.80" x 3.25" and 6.90" x 2.88" and 5.90" x 2.46" and 4.90" x 2.05" and 3.90" x 1.64"
Tuck this lovely corner design onto shirt pockets, placemats, or quilts for an added hint of elegant flair. 3.25" x 3.25" and 2.88" x 2.88" and 2.46" x 2.46" and 2.04" x 2.04" and 1.63" x 1.63"
The designs can be ordered separately -- just click on the links shown above. Or you can buy them in a design pack for an even deeper discount! 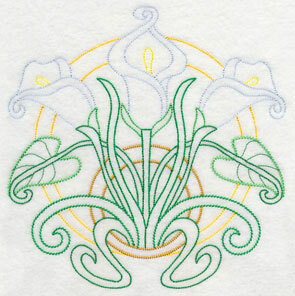 The beautiful calla lily designs are also available in the ever popular "vintage" style, known for its light stitches and open spaces. We love the way it looks like hand embroidery and it's a great addition to tea towels, light linens, and quilter's cotton. 7.74" x 7.79" and 6.85" x 6.90"
5.87" x 5.90" and 4.89" x 4.90"
7.79" x 7.80" and 6.89" x 6.91"
Add the delightful floral designs to a variety of embroidery projects, such as tablecloths, napkins, and even apparel! The beautiful blooms look fabulous on skirts, dresses, and blouses. 3.29" x 7.80" and 2.92" x 6.90"
2.50" x 5.90" and 2.08" x 4.90"
The intricate details of this Art Deco flower border makes it a terrific embellishment for table runners, aprons, and more. 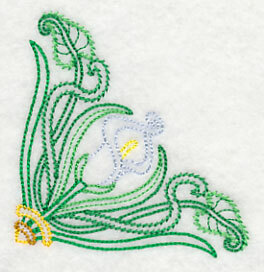 Bonus: The nature of the vintage-style designs mean they're surprisingly quick-to-stitch, too. 7.80" x 3.30" and 6.90" x 2.92" and 5.90" x 2.50" and 4.90" x 2.08" and 3.90" x 1.64"
Spring and summer linens are the perfect choice for calla lilies, especially this pretty corner design. 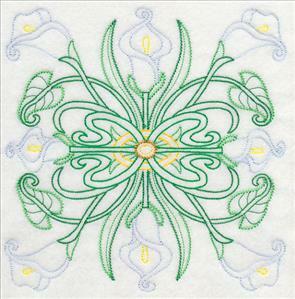 Use it anywhere you would find hand embroidery -- quilts, linen napkins, and more! 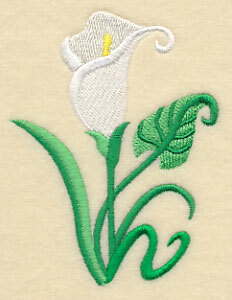 3.29" x 3.29" and 2.92" x 2.92" and 2.50" x 2.50" and 2.08" x 2.08" and 1.65" x 1.66"
Add these lovely calla lilies to your embroidery projects. The designs can be ordered individually (just click on the links shown above) or bought all together in a design pack! Art Deco design is distinctive in its vibrant use of geometry, and is oftentimes noted as representing luxury, glamour, and exuberance. These fun and fabulous designs are a magnificent example of the characteristics of classic Art Deco style. 11.75" x 3.92" and 9.40" x 3.14"
7.80" x 2.61" and 6.00" x 2.22"
5.71" x 5.70" and 4.87" x 4.86"
Add these border and corner embroidery designs to your next project. Bold colors and eye-catching patterns are dramatic additions to table runners, placemats, napkins, and more! 11.75" x 3.89" and 9.40" x 3.12"
7.80" x 2.59" and 6.00" x 2.14"
Art Deco style is also known for its use of symmetry in designs. These border and corner designs are fabulous examples of that type of style, plus are terrific additions to a wide variety of embroidery projects! 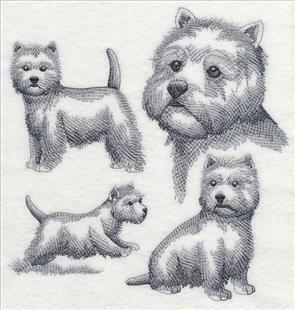 11.75" x 3.95" and 9.40" x 3.16"
7.80" x 2.62" and 6.00" x 2.23"
We love getting your ideas and suggestions for new designs in our inboxes, like Kathleen's request for a West Highland Terrier. 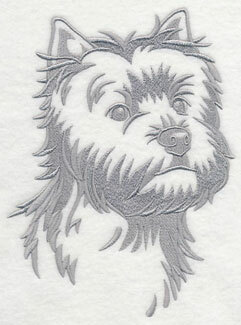 Stitch the adorable pup in one of two different ways: a classic silhouette design and a sketch of the terrier in varying stages of play. Thanks for the suggestion! 7.50" x 7.80" and 6.90" x 7.19"
5.86" x 6.13" and 4.85" x 5.04"